The journey towards mandating itemized payslips in Singapore has been fraught with challenges. Migrant workers’ rights group, Transient Workers Count Too (TWC2), has for years argued that itemized payslips, along with salary payment through banks, are necessary for creating audit trails that help combat salary abuse. In March 2013, when the proposal to legislate mandatory payslips and salary records of all employees came to light in parliament, there seemed to be a glimmer of hope – not just for migrant workers, but local low-wage workers as well. However, when the ruling was deferred, instead of passed along with the amendments to the Employment Act (EA) on 12 November last year, it was hardly surprising. Strong objections to the move were already articulated 4 months prior, in a Straits Times report titled “Payslip rule weighs heavily on SMEs.” The article highlighted that 7 out of 10 SMEs thought that issuing itemized payslips will add to their business costs. In response to the deferment, labour MP Zainal Sapari called for a timeframe to make it compulsory for businesses to issue payslips. Refusing to do so allows irresponsible employers to continue exploiting low-wage workers and cover their tracks when they pay less than they should, he said. Last week, when the amendments to the EA came into effect, the Ministry of Manpower (MOM) shared some tangible solutions that make it easier for companies to comply with the ruling. 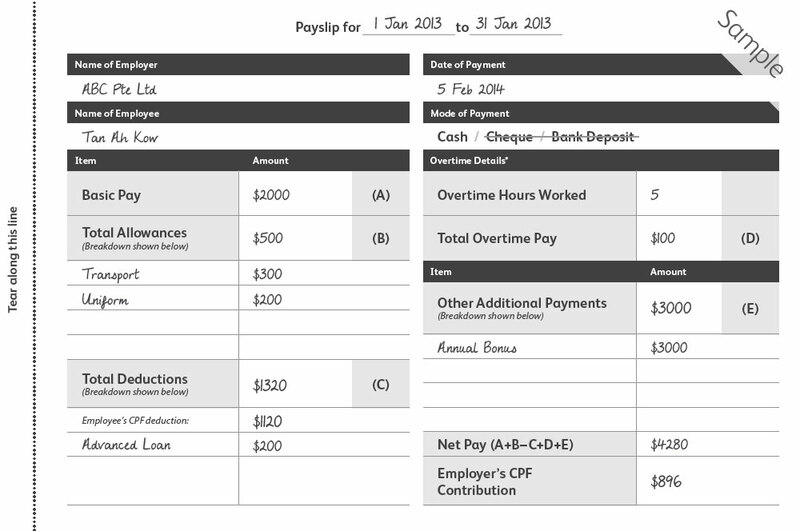 They include downloadable payslip templates for micro businesses with very few employees (see above), a free software called SP-Pay (available on the MOM website on 20 April 2014) for companies with up to 20 staff and funding options (including the Productivity and Innovation Credit Scheme) for companies that have more complex needs. So there really is no need to wait until 2016 to do the right thing. The resources are available now. Low-wage workers who have been getting the short end of the stick have waited long enough for this ruling to come into effect. This does not just affect migrant workers. It could happen to your parents, grandparents or your younger sibling during his/her first internship or job. Without itemized payslips, they would have no way of knowing how their salaries were calculated and how to resolve salary disputes when the payment does not quite add up. Though insufficient, the move to legislate itemized payslips is still a step forward. Salary payments through banks must be made mandatory so that employers are compelled to leave an audit trail and not inflate salaries only to produce records after the fact. Let’s cross this bridge now, instead of 2016, so we can move on to the next one sooner. Payroll management can be a breeze with Rikvin's game-changing Payroll Management Services and Payroll Software. Be served by a dedicated Payroll specialist who will ensure strict compliance with Singapore's statutory laws.